* Cash Back may not appear in your Extrabux account until up to 40 days (60 days for Car Rentals) after travel has been completed. Using coupons not found on Extrabux may void Cash Back. Retail Hotel = customer pays at check-in. Pre-paid Hotels = customer pays at the time of booking the room. Orders redeeming Orbucks will earn Cash Back on the order total after redemption. * Cash back not available on Insurance. 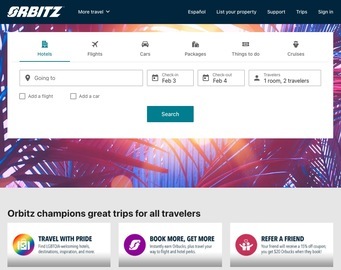 Click a Coupon or click Start Shopping to earn Up to 3.5% Cash Back at Orbitz.